The October 2018 Monthly Checklist winners have been announced and the prizes have been rewarded. Congratulations to all of those who have won. Don't forget, this is a monthly permanent feature that you can enter for FREE. If you haven't already, it's time to start entering the November event! A new Weekly Quest Contest has just started. This week's quest game is Sewer Monster. The challenge is to complete as many of these Quests this week. The top 3 players at the end of the challenge will receive a Candy Costume, 200,000MP and a Gold Trophy, the next 6 players will receive 150,000MP and a Silver Trophy and the next 9 players will receive 100,000MP and a Bronze Trophy. Happy Halloween to all of our players! We hope you enjoyed our 2018 Maraween events so far. All Eleka pets will receive DOUBLE STATS at the Gym and Elite Gym until November 8th. All Eleka, Insideout, Gothic, Vampire, Halloween, Phantom, Mad Scientist, Nefarious, Bug, Skeleton, Ghost, Witch, Dark, Zombie, Wizard, Voodoo, Vampire, Goblin, Rotten, Midnight, Killer, Headless, Mutant, Mummy, Werewolf, Nightmare, Monster, Poison or Devil pets will receive FREE TRAINING at the Gym and Elite Gym until November 14th. And all Eleka, Insideout, Gothic, Vampire, Halloween, Phantom, Mad Scientist, Nefarious, Bug, Skeleton, Ghost, Witch, Dark, Zombie, Wizard, Voodoo, Vampire, Goblin, Rotten, Midnight, Killer, Headless, Mutant, Mummy, Werewolf, Nightmare, Monster, Poison or Devil pets will receive FREE LESSONS at the School until November 14th. The Straya can now wear the Halloween Costume and the Chibs now wear the Gothic Costume. The Decadal, Eyru, Justin, Limax, Lorius, Raulf and Zola can now wear the Mummy Costume. This means that all pets can finally now wear this costume. A new Weekly Battle Contest has just started. This week's opponent is Invader. You will need to have a Invader Trading Card in your Battle Deck. The challenge is to win as many battles against this opponent this week. The top 3 players at the end of the challenge will receive a Nocto Trading Card, 200,000MP and a Gold Trophy, the next 6 players will receive 150,000MP and a Silver Trophy and the next 9 players will receive 100,000MP and a Bronze Trophy. The Azul, Chibs, Crikey, Doyle, Raulf, Reese, Troit and Yuni can now wear the Eleka Costume. The Lottery has been drawn for this week. starrykyu is the winner of the 2,144,000MP Jackpot with the winning numbers of 5, 10, 18, 20, 28 and 45. Congratulations! Last Week's Raffle has now ended. behappy is the winner of the Red DNA and 100,000MP prize with the winning raffle ticket number 619988. Congratulations! Make sure you buy your tickets for today's raffle - only 10MP per ticket! The Game of the Week has changed to Whack an Azul and this week's Olympics Event is Weight Lifting. Voting has closed and a new Shop of the Week has been decided. For the next 7 days, the Candy shop has a 2 for 1 sale. Every time you buy an item from this shop you will pay for one and receive two. Vote Now for next week. All pets wearing a Bronze Costume will receive Double Training stats this week at the Gym and Elite Gym. Vote Now for next week. All pets wearing a Light Fairy Costume will receive Double Education stats this week at the School and University. Vote Now for next week. We successfully completed Server Maintenance this week without any downtime. The main PHP server nodes in our cluster have increased from 17 to 26. All have been upgraded and MaraPets is now running faster and more stable than ever. If you haven't noticed a difference, that's great too as visitors to the site have been twice as many as last month and we're running great. Thanks to all of our supporters who help to keep us open! A new set of limited edition Halloween items are now on sale at the Account Upgrades Shop. They will all automatically retire November 20th. T R I C K O R T R E A T ? Our Maraween Character Trick or Treat has just started. It will end automatically on November 15th. To take part in Character Trick or Treat, all you need to do is dress your character up in an approved Halloween Character Costume, . Then you can visit the profile of any player that is currently online, hit the Trick or Treat button and receive a prize every time! You can only Trick or Treat each person once per day and you will receive MP or an item. All of these item prizes will retire at the end of this event too! A new Weekly Quest Contest has just started. This week's quest game is Simerian Excavator. The challenge is to complete as many of these Quests this week. The top 3 players at the end of the challenge will receive a Fire Costume, 200,000MP and a Gold Trophy, the next 6 players will receive 150,000MP and a Silver Trophy and the next 9 players will receive 100,000MP and a Bronze Trophy. For a limited time only, the retired Scorpio Treasure Chest is back on sale at the Account Upgrades Shop. It will all automatically retire November 10th. The Willa, Yakubi and Zola can now wear the Slime Costume. A new Weekly Battle Contest has just started. This week's opponent is Beelzebub. You will need to have a Beelzebub Trading Card in your Battle Deck. The challenge is to win as many battles against this opponent this week. The top 3 players at the end of the challenge will receive a Nightmare Trading Card, 200,000MP and a Gold Trophy, the next 6 players will receive 150,000MP and a Silver Trophy and the next 9 players will receive 100,000MP and a Bronze Trophy. 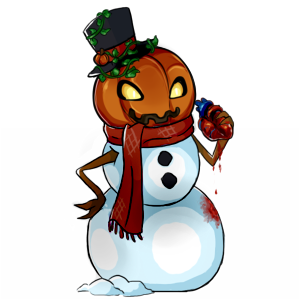 The Snowman has taken Halloween a little too seriously AGAIN this year! He is now only asking for Halloween Treats and he is giving out these new prizes. All of these prizes will retire when the Halloween Snowman quests end November 7th. The Halloween Treats shop will be restocking DOUBLE STOCK at every single restock from now until November 7th. The Lottery has been drawn for this week. prettyangelz is the winner of the 2,026,100MP Jackpot with the winning numbers of 5, 12, 15, 30, 47 and 48. Congratulations! Face Make Up is back under new ownership and can be invested in again. Shares are starting at 677MP. Last Week's Raffle has now ended. kimiix is the winner of the Red DNA and 100,000MP prize with the winning raffle ticket number 600700. Congratulations! Make sure you buy your tickets for today's raffle - only 10MP per ticket! The Mission of the Week has now changed. Earn 50% more MP completing levels of Circus this week. All pets wearing a Cupid Costume will receive Double Training stats this week at the Gym and Elite Gym. Vote Now for next week. All pets wearing a Green Costume will receive Double Education stats this week at the School and University. Vote Now for next week. A new Maraween Pumpkin Hunt has just started for 2018. It will last until November 21st. As you browse and play the site as normal, check out every page for a Pumpkin in a box. When you find it, click it and you may get a prize! These prizes are listed below. You may also win a Pastel Costume! The 250 different players who collect the most pumpkins will receive 1,500,000MP and a limited edition Possessed Ian Trading Card. The next 250 will just get a Possessed Ian Trading Card. This year, 10 random players who will collect 100 pumpkins or more will win £10, 15 will receive £5 and 20 players will receive £2 Account Upgrade Credits! Elger has taken the time off from doing quests during this holiday season. Instead, you can visit her with your pet dressed up for Halloween to go Trick or Treating for FREE once every 20 minutes - Eleka Pets can visit once every 15 minutes! All you need to take part is a pet wearing a Halloween, Mad Scientist, Nefarious, Bug, Skeleton, Ghost, Cursed, Witch, Dark, Zombie, Wizard, Voodoo, Phantom, Goblin, Rotten, Midnight, Insideout, Gothic, Eleka, Killer, Headless, Mutant, Mummy, Werewolf, Nightmare, Monster, Poison or Devil costume. These prizes will retire when the Elger Trick or Treat ends November 13th. The Eleka Costume was first released in January 2007 in Account Upgrades and the costume has been retired and forgotten about ever since. A new version of the Eleka Account Upgrade has been released, with 7 new Eleka themed items and either a Eleka coloured Snookle or Bolimo Enchanted Plushie. This AU will retire December 5th. The Addow, Astro, Bolimo, Dakota, Feliz, Gizmo, Justin, Kronk, Lati, Rusty, Snookle and Straya can now wear the Eleka Costume. Twelve of the oldest and worst Eleka pets have been updated to match the new style. A new Weekly Quest Contest has just started. This week's quest game is Candy Tree. The challenge is to complete as many of these Quests this week. The top 3 players at the end of the challenge will receive a Red Panda Costume, 200,000MP and a Gold Trophy, the next 6 players will receive 150,000MP and a Silver Trophy and the next 9 players will receive 100,000MP and a Bronze Trophy. Back again for 2018 Maraween! The Enpiah Alien was trick or treating in Undying Woods last night and was bitten! Until November 15th, the Halloween Alien has new items that he will put up for Auction for only 1MP. These items will retire at the end of the event. If you are really lucky, you may catch a very rare or retired Halloween item! There are 4 new prizes for 2018. A new Weekly Battle Contest has just started. This week's opponent is Xor. You will need to have a Xor Trading Card in your Battle Deck. The challenge is to win as many battles against this opponent this week. The top 3 players at the end of the challenge will receive a Bigfoot Trading Card, 200,000MP and a Gold Trophy, the next 6 players will receive 150,000MP and a Silver Trophy and the next 9 players will receive 100,000MP and a Bronze Trophy.